Have a glass on the go! The TrailHeads Wine Cup is easily portable so you can take it wherever your adventures may lead. Weighing in at 6.5 ounces it is excellent for camping and outdoor use. The cup has a capacity of 17 oz and is made from 18/8 stainless steel. It is both environmentally friendly and BPA free so you can sip your wine worry free. An attractive glossy white with the blue TrailHeads logo, the cup is simple and elegant. Sip from it next to a bonfire or keep it in the cupboard of your woodsy cabin. The TrailHeads Wine Cup is an excellent addition to your cabinet. Hand wash to clean. Do not leave in freezer. 17 oz CAPACITY- Our TrailHeads Portable Wine Cup will hold 17 oz of cold liquid! 18/8 STAINLESS STEEL- this single wall wine cup is BPA free and environmentally friendly. MADE FOR TRAVEL- designed for use on the go, take your wine cup with you when you’re camping or hiking. Lightweight and durable it fits easily in a backpack. 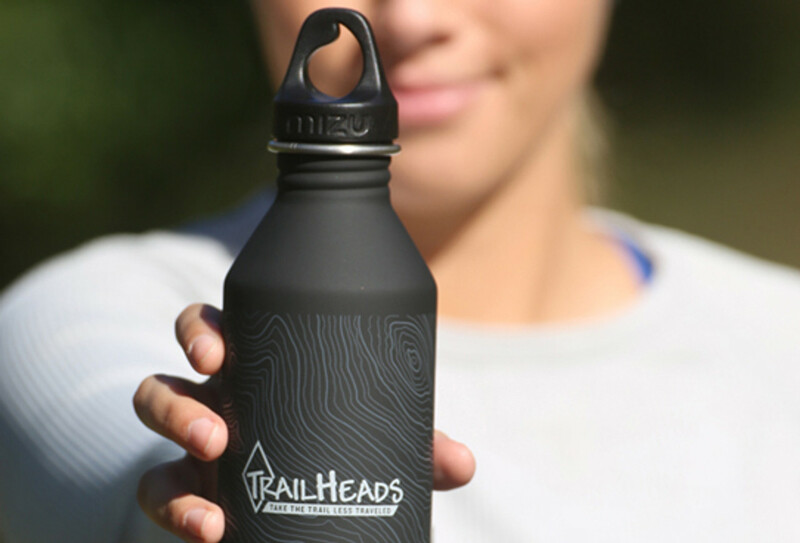 ATTRACTIVE DESIGN- The cup is glossy white with the blue TrailHeads logo on the front. Kent, CT and Mizu logo appear on the back.